Here we are with #SundaySupper and it is picnic time again, woohoo!! Summer, don’t you just love it!! I chose to do a Japanese Noodle Salad. This recipe has been around forever but I wanted to update it with adding a bunch more veggies and giving it a face lift with an invigorating dressing!!! This can be easily made ahead and taken on a picnic to enjoy with family and friends. It could be a meal onto itself with a small hot dog or just even a bun. Add in some fresh fruit and you have a picnic, it is as easy as that, when you have a star like this salad!! The little black sesame seeds add a nice variance in color and taste!! 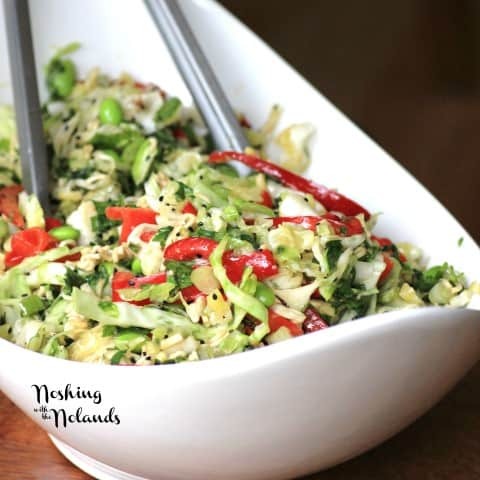 The salad has great crunch from so many of the different veggies, nuts and the noodles. The salad was suppose to have chicken in it but I omitted that right away. I like that it is vegetarian. Have your meat on the side but you can for sure add it back in and it really would be a complete meal. Take nothing more than this big crunchy, delicious salad to munch under a tree for your picnic!! It is so packed full of goodness, I loved adding in the edamane, one of my favorite Japanese veggies. A bit of a pain to shell but get a hubby or kid in there to help (that is what I did)!!! A Japanese inspired salad choked full of wonderful veggies! Whisk all the dressing ingredients together and then slowly add the oil while whisking until incorporated. Toss all the salad ingredients together and add the dressing and again toss well. You can make the salad and dressing separate and about ½ hour prior to serving toss. 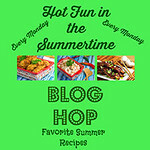 Look at this amazing list of recipes for you to enjoy all summer long on all your picnics, I can’t wait to try some!!! Such a beautiful dish Tara! I have been discovering more and more Japanese food lately and this salad sounds amazing! Thanks for sharing! Thank you so much for coming over!! Beautiful salad with all of my favorite flavors too. 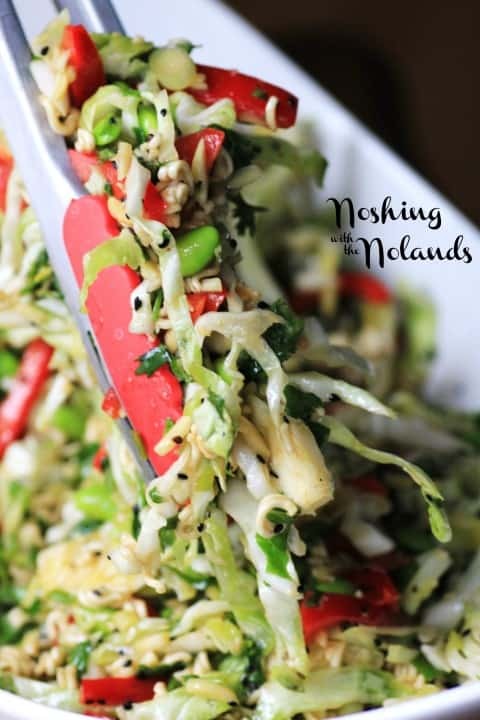 I love crunchy noodle salad but I’ve never made it at home. Must rectify that with your wonderful recipe, Tara! Thanks so much Stacy, I hope you do make it!! This looks so fabulous, Tara! 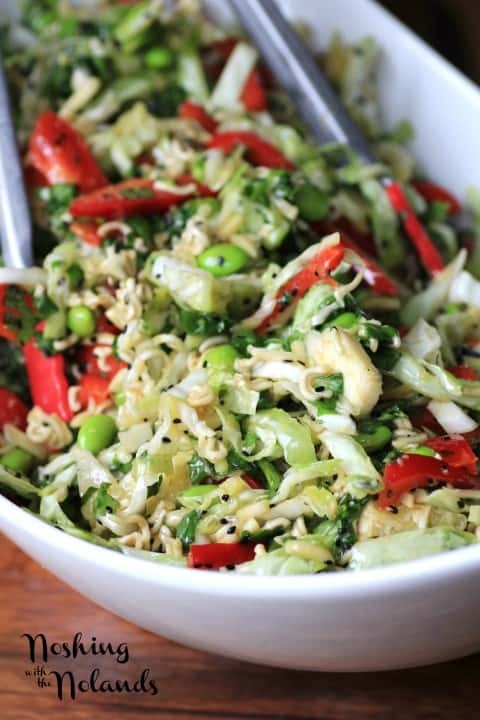 An updated version of the Asian ramen salad that was the rage years ago!! I love this salad Tara. Such a wonderful change up from your typical picnic salads! My boss used to always make a salad like this when we had company potlucks. I LOVED it. I’m so excited to find a similar recipe! Thanks so much Courtney, I hope you enjoy this one too!!! You and I pack our picnic baskets very similiarly, my friend. I ALWAYS take an Asian noodle salad of some sort! I love that you’ve snuck kale into this one. It looks amazing! Thanks so much Lori, I think I actually need to go get some more of this right now!! Wish I had yours too!!! Very unique twist! Sounds delicious! What a great salad. 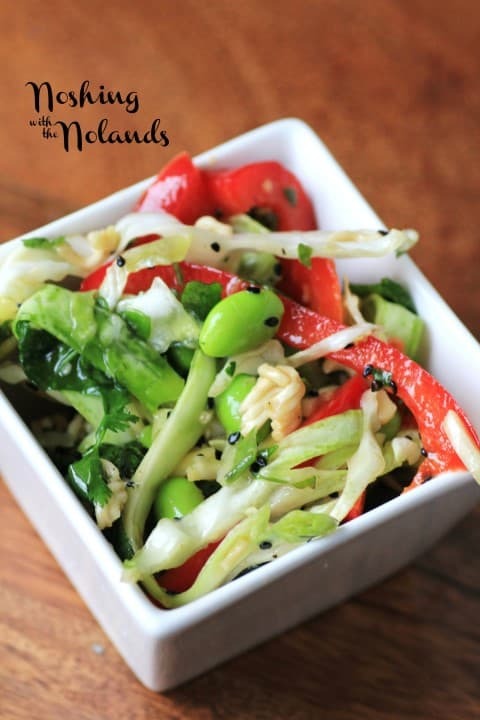 I love adding edamame to my salads, too! I am going to add edamane to more salads, thanks Shaina! Such an amazing looking salad Tara. And I KNOW it tastes great! This is perfect for Sous Chef! I think I just found my 4th of July salad. Lovely styling too! I hope you enjoy it Christy, Happy 4th of July!! Great facelift on a classic salad. I LOVE all the crunch you added!! Have always loved this salad, and look what you have done with it! Magnificent! Thanks so much Dorothy, we really did enjoy it. Love summer salads!! Thanks Janice, it was very good!! Thanks so much Brandi, you are always so kind!! The last thing I want at a picnic is a limp, wilted salad. This one, with so much crunch, is perfect! I absolutely love salads like this! Your site looks awesome too! Thank you so much for the kind words Laura!! Oh my Tara I really want a big bowl of this right now! I love that you left the chicken out and made it a veggie version! So colorful, Tara! Love the crunch factor! This looks so fresh and delicious! I will definitely be giving this a try. Sharing on The Love Nerds FB page tomorrow! Thank you so much Maggie, I appreciate that! Forget about waiting for the next time we picnic to try this salad, it looks way too good to wait. Goodness, what a gorgeous salad. I’ll have to put this one on my summer must-make list!